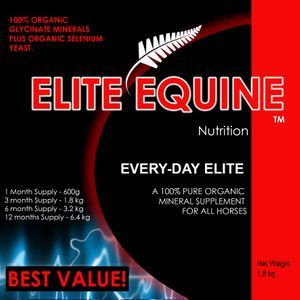 Elite Equine - EVERY-DAY ELITE New! ALL THE BENEFITS OF 100% ORGANIC MINERAL SUPPLEMENTATION AT AN INORGANIC PRICE! You asked and we listened! Some of our customers who own several horses who just LOVE what pure organic mineral supplementation does for their horses have expressed how hard it is to afford quality mineral supplementation for multiple horses. Other customers are just more budget conscious. In response to this need, we have put together a 100% pure organic mineral supplement using organic gycinate minerals, for the same cost as inorganic budget products! Why buy lower quality inorganic mineral supplementation proven to be poorly and unequally absorbed when you can feed a 100% organic product with superior absorbtion for a similar or lesser cost! You'd be crazy not to take advantage of this wonderful product! EVERY-DAY ELITE comes in several sizes to suit every customer. It is a low volume dose so be sure to take the daily dose size into consideration when comparing prices and pack sizes with other products! Elite Every-Day comes in 600g (1 month), 1.8kg, 3.2kg and 6.4kg foil bags. WHAT IS THE DIFFERENCE BETWEEN ELITE EVERY-DAY AND ORGANIC PLUS? Organic Plus is formulated with proteinate organic minerals and contains higher levels of organic magnesium. While Elite Every-Day also contains organic magnesium, it is at 'general health' levels rather than "magnesium supplement" levels. If you are after a prodcut with an organic magnesium supplement included then Organic Plus or Compete are best for you. Why don't we include vitamins in our formulations? Because horses can synthesize vitamins in their bodies and absorb what is needed from fresh feed and pasture. Vitamins are freshly generated substances that do not store well. The only vitamins horses cannot supply themselves are vitamins A & E but both these vitamins are plentiful in pasture and hay. Minerals are either in the ground or not, and cannot be synthesized. Mineral deficiencies influence the absorbtion of other minerals, vitamins, and effect health, soundness, productivity and performance.